This is the model that has kick-started the X3 as a truly sporty small BMW SUV. 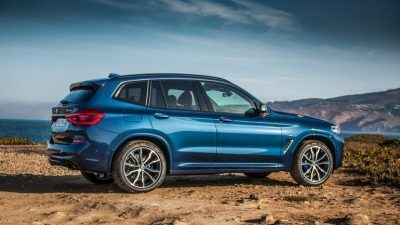 The X3 design has been around for two generations, and with new generation BMW X3 being available with a high performance engine, the X3 can now appeal to the driving enthusiast too. Just recently having arrived as the 2018 BMW X3 M40i, this is the model you want if you want to experience some enthralling acceleration and sporty driving dynamics. Now offering power ratings just short of what an M2 delivers, the 3.0-litre, six-cylinder, twin-turbo X3 M40i has a real kick that will shove you through to 100 km/h from a standstill in less than five seconds. There are serious levels of torque from right down low in the engine revs which peaks at 500 Nm, so with this sort of pull you really quickly pile on the speed and you can tow a weighty trailer (2000 kg braked). A limited top speed of 250 km/h is easily within reach so best to use your adaptive cruise control to keep things as legal as possible. The otherwise refined engine has a lovely low growl synonymous with some of the best Motorsport BMW engines have on offer – especially when the accelerator is opened right out. Scampering point-to-point, the new AWD BMW X3 M40i has a lovely balance and steering precision that is lacking in some other sporty SUV rivals. Stopping power is absolutely tenacious with the M-grade brakes. ABS and accident avoidance systems work to keep you all intact and safely heading in the right direction. By the way, safety kit in this sweet family wagon is five-star rated and set to protect. Design sees the latest X3 more rounded, better proportioned, and lower to the ground for a better centre of gravity. 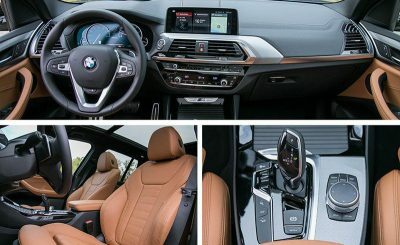 You’ll enjoy the fantastic raised driving height that the X3 SUV provides, and the beautifully crafted leather interior is extremely well muted from wind and road noise. The new X3 M40i is longer and wider which has the added benefit of creating more cabin space as well as a better ride quality. There is a Luxury line of X3 vehicles as well as the M-Line of cars, and it’s the M-Line M40i that boasts lovely aggressive alloys, slim line spoilers and side skirts as well as the uprated suspension to handle the performance that the 265 kW 3.0-litre Twin-Turbo is capable of. This extra kit does enhance the vehicle’s aerodynamics. An M-exhaust system looks nice with its twin tail pipes but also emits the low down growl that means business for all to hear. 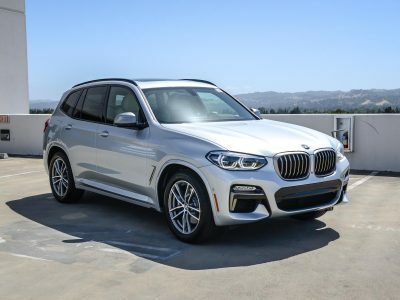 BMW X3 M40i models come with the classic chrome surrounded kidney grille that houses active air vents for engine cooling at lower speeds and enhanced aerodynamics at higher speeds. BMW has given the new X3 generation some gorgeous DRLs as well as striking headlamp styling that ensures you get noticed for more than just the safety benefits. As you arrive to enter the BMW X3 M40i at night, a light carpet illuminates the ground area surrounding the doors. The light design is fanned and graceful. An integrated spoiler and roof railings look superb, while the tail lights are LED and beautiful. Over 200 mm of ground clearance gives some flexibility for heading along back roads and scampering across wet fields, and with AWD traction you can enjoy some freedom for light off-road duties and a ski weekend adventure. A huge boot can swallow loads of cargo (over 800 litres with the rear seats in place) and there is a cargo blind for discretion – which can be stored under the floor when not required. You’ll also note a decent under floor bin for carrying more stuff, as well. A 12V power source is handy in the boot space, so who knows what electrical gadgets you will be able to power while on a family picnic. Rear seat space is really very good in its class for the two occupants on the window seats. The person in the middle has good seating but will have to deal with the driveline hump on the floor. A panoramic moon roof is available, ambient interior lighting and reclining rear seats are all features of the new 2018 X3. Head-up display, a Lane Change Assist, eight speed sport shift automatic, i-drive, a wireless charging device, Apple CarPlay, 10.2 inch touchscreen, Blind Spot detection, a rear parking camera and Park Assist, Drive Mode selection and massaging sport electronic leather seats are some of the cool M40i features. Masses of response, comfort and flexibility is what you get in the brand new AWD BMW X3 M40i. Oh-so powerful and actually intriguingly refreshing – particularly for the X3 range of SUVs that have been around a while. This keeps the Volvo XC60 T6 and Audi RS5 humble. For any more information on the 2018 BMW X3 M40i or, for that matter, any other new car, contact one of our friendly consultants on 1300 303 181. If you’d like some fleet discount pricing (yes even for private buyers! ), we can submit vehicle quote requests out to our national network of BMW dealers and come back with pricing within 24 hours. Private Fleet – car buying made easy!